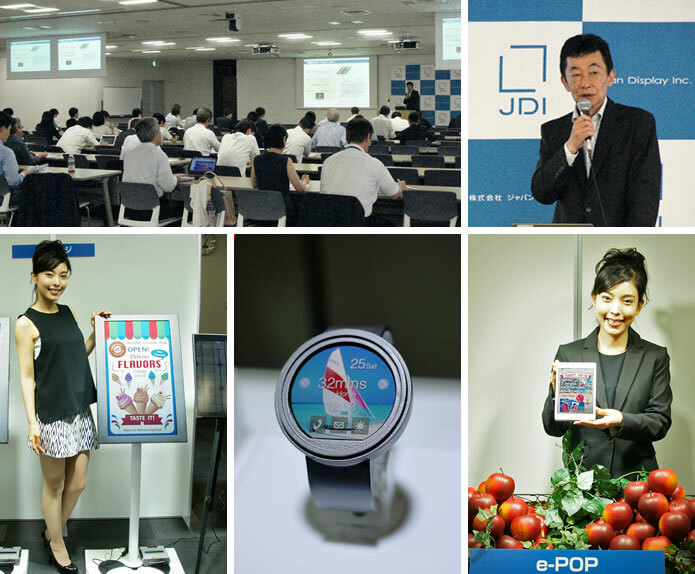 ﻿ News&Event : Event | Japan Display Inc.
Japan Display Inc. (JDI) held a business briefing session highlighting reflective color LCDs on Jun 15, 2015. Shuji Aruga (Director and COO) delivered the keynote address, emphasizing "expanding non-mobile business" and "B2B business", in which reflective LCDs will play a key role. During his address, Mr. Aruga noted that JDI's innovative reflective color LCDs will contribute to changes inpeople's everyday life, through their adoption of ultra-low power consumption technology which uses less than 0.5%* power for still images compared to conventional transmissive LCDs, and by adopting other proprietary technologies to enhance visibility under direct sunlight. Besides wearable devices such as smart watches, applications for reflective color LCDs will also include special purpose PC monitors/readers, industrial devices, electronic shelf labels/POP, and digital signage. JDI has also announced "Medium-term Management Goals" that strive for more than 30% of JDI's sales to be derived from non-mobile display business (automotive, reflective LCDs, and OLEDs) in 5 years.